Noss & Cooperrider reviewed many conservation planning initiatives and determined that between 25% and 75% protection was necessary to maintain ecological integrity. Written by two leading conservation biologists, Saving Nature’s Legacy is a thorough and readable introduction to issues of land management and conservation biology. 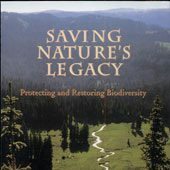 It presents a broad, land-based approach to biodiversity conservation in the United States, with the authors succinctly translating principles, techniques, and findings of the ecological sciences into an accessible and practical plan for action. Throughout the volume, the authors provide in-depth assessments of what must be done to protect and restore the full spectrum of native biodiversity to the North American continent. Thank you for the good writeup. It if truth be told was a enjoyment account it. Look complicated to far added agreeable from you! However, how can we keep up a correspondence?